Many beginning crocheters are guided toward choosing patterns that are worked flat (in rows). Scarves, baby blankets, and wash cloths are a few of the more common examples. These are all wonderful projects, but you don’t have to be limited to working in rows, even if you’ve only mastered a few stitches. 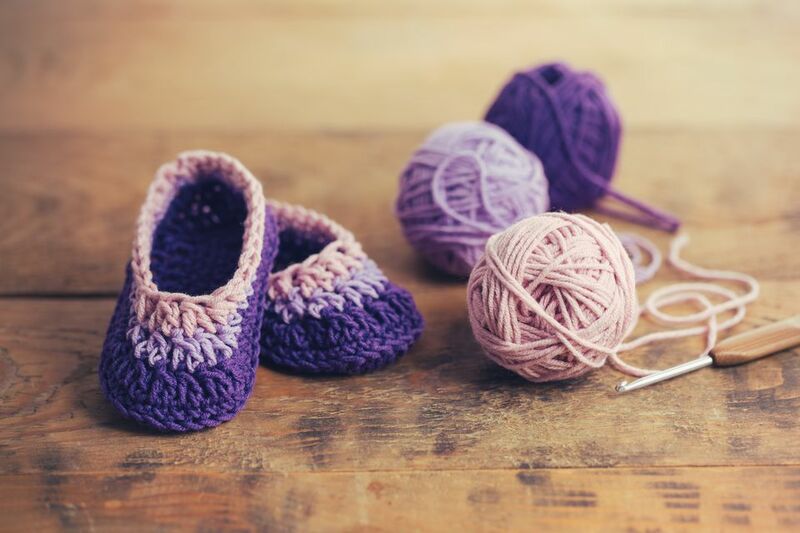 Crocheting in the round is easily achievable and will open you up to a wider range of possible projects such as hats, mittens, and booties, to name just a few. There is even a chance that once you get going you’ll find working in the round to be easier because you never need to stop and turn your work around. Before you go on, make sure you are familiar with the following stitches: chain stitch, single crochet, and slip stitch. If you’re comfortable with these three basics then you are ready to grab some yarn and a hook* and move on to Creating a Round. This is a tutorial so materials are not critical. However, a smooth worsted weight yarn and hook size H/5mm or I/5.5mm are recommended for ease. Step 5 gives an example for creating simple coasters or trivets. For this project, you would need a worsted weight yarn with 100% cotton content. The first step to working in the round is creating a loop, or center ring, into which our first round of stitches will be made. There are a few different ways of making this loop, but for now we will discuss the most common. Begin by chaining four stitches. Work a slip stitch into your first chain (see photos 1 and 2). This joins your stitches and creates the needed foundation loop. From now on we will refer to this loop as our center ring. Chain 1 stitch. This gives you some distance between the hook and the center ring and is equivalent to chaining up one (or more depending on the stitch pattern) before beginning a row when you’re working flat. The next step is creating your first round of stitches. For our example, we will be using single crochets. Insert your hook through the center ring, not into an individual stitch, and pull a loop through (see photos 3 and 4). There should now be 2 strands of yarn on your hook. Yarn over and pull through both loops on your hook. You have just worked one single crochet through the center ring. Work 6 more single crochets in the same manner. After you’ve completed 7 total single crochets through the center ring, slip stitch into the chain 1 you made prior to working your single crochets (see photos 5 and 6). This slip stitch joins your first and last stitches and finishes the round. We will count the first chain of every round as one single crochet, which means your completed first round consists of 8 stitches. Now that you have this round of stitches, what happens next? How does the round grow and what can you do with it? If you were to continually chain up 1 stitch, work 1 single crochet in every stitch around, and slip stitch to finish the round, you’ll find that your work begins to curl at the edge. Without increasing the number of stitches, and therefore the surface area, we leave nowhere for our work to go but up. The circumference of your work will begin to curl in on itself, reaching toward the center. In some instances, this is a good thing. For example, a hat or basket that requires sides. However, you’ll most likely want the base of these pieces to be larger than 8 stitches. To make your round continue to grow you will need to add stitches at regular intervals. Increasing stitches adds more surface area of fabric and allows the round to continue to spread out and grow larger without curling in on itself. The following is a good formula for increasing that can be applied to any number of stitches. For now, we will assume you have chained 4, joined your center ring, worked stitches into the ring as discussed above, and now have 8 single crochet stitches joined in a round. By now you might have noticed a pattern to the placement of increases. On every round you’re working 1 more stitch before making an increase. (For example, if you were to do an Increase Round 5 you would single crochet into 4 stitches before increasing by working 2 single crochets into the next stitch.) You may continue in this manner until your fabric reaches the desired diameter. For a fun practice project, use worsted weight cotton (try Lily Sugar’n Cream or Lion Cotton by Lion Brand Yarns) and an H or I crochet hook to make your rounds (see photo of finished round). These sample pieces can become coasters (4 to 5 inches diameter) or trivets (5 to 9 inches diameter). Sew two rounds of the same size on top of each other for double thickness and protection.